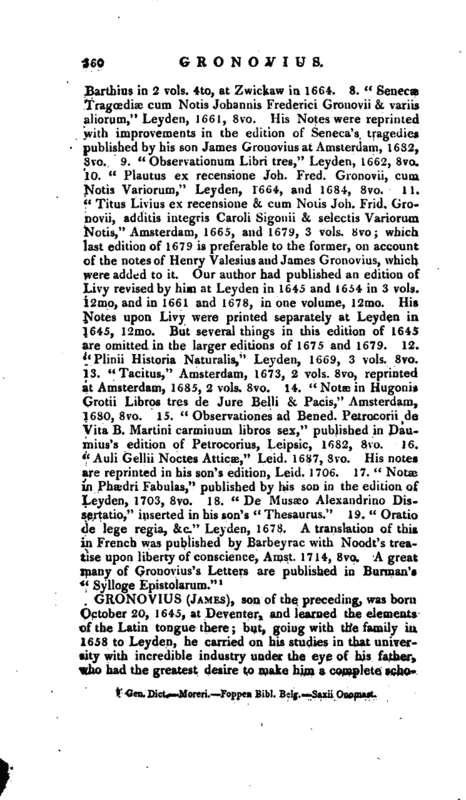 , son of the preceding, was born October 20, 1645, at Deventer, and learned the elements of the Latin tongue there; but, going with the family in, 1658 to Leyden, he carried on his studies in that university with incredible industry under the eye of his father, who had the greatest desire to make him a complete | scholar. In this view he not only read to him the best classic authors, but instructed him in the civil law. About 1670 he made the tour of England, and visited both the universities, consulting their Mss. 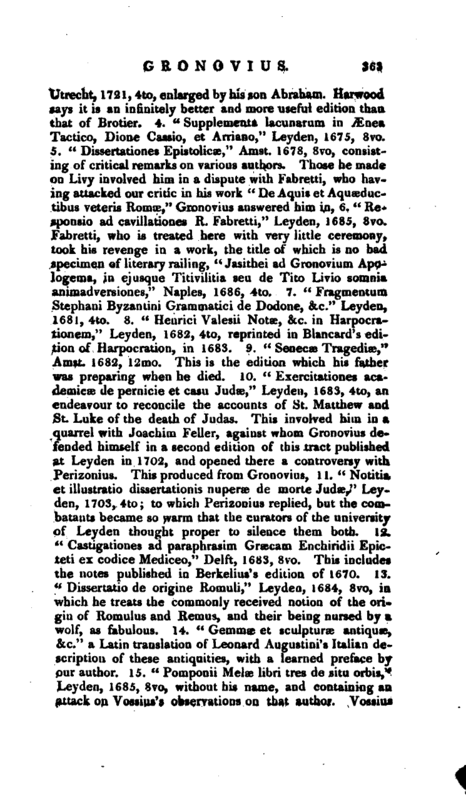 ; and formed an acquaintance with several eminent scholars, particularly Dr. Edward Pocock, Dr. John Pearson, and Dr. Meric Casaubon, which last died in his arms. He was much pleased with the institution of the royal society, and addressed a letter to them in approbation of it. 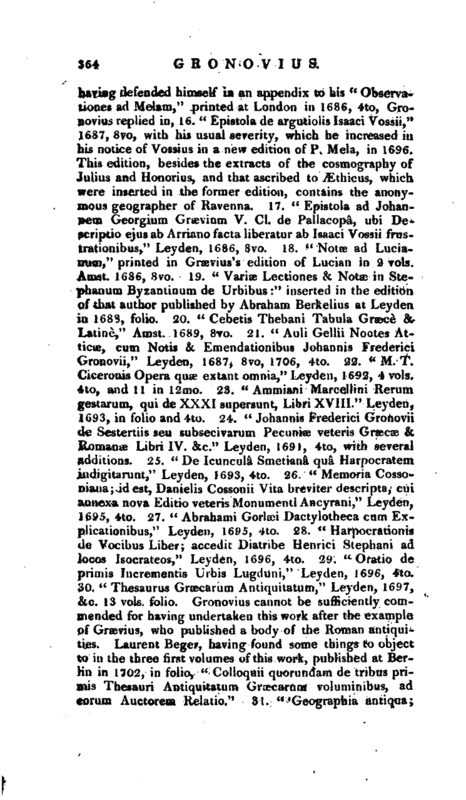 After some months’ stay in England, he returned to Ley den, where he published an edition of Macrobius that year in 8vo, and another of Polybius the same year at Amsterdam, in '2, vols. 8vo. 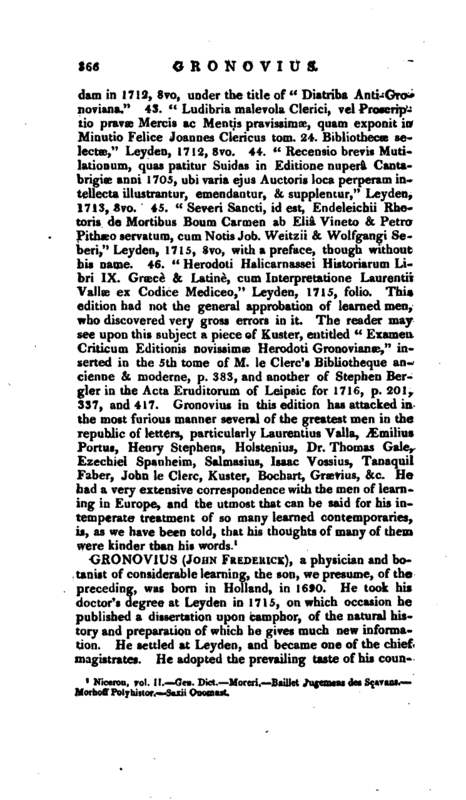 The same year he was also offered the professorship held by Hogersius but, not having finished the plan of his travels, he declined, though the professor, to engage his acceptance, proposed to hold the place till his return. 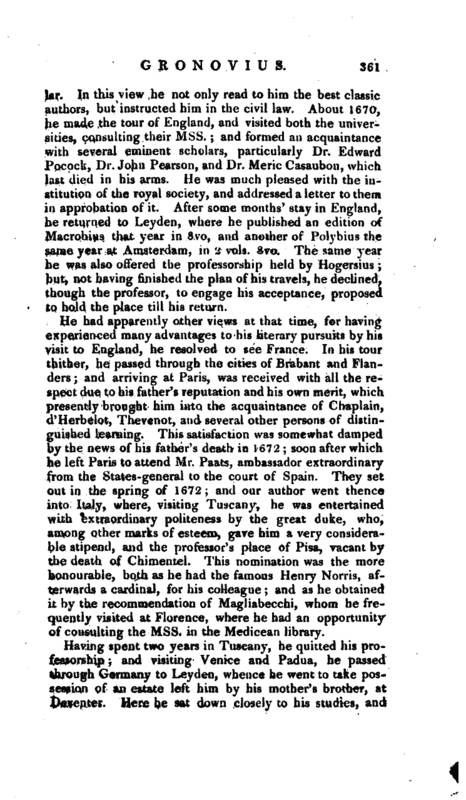 He had apparently other views at that time, for having experienced many advantages to his literary pursuits by his visit to England, he resolved to see France. In his tour thither, he passed through the cities of Brabant and Flanders; and arriving at Paris, was received with all the respect due to his father’s reputation and his own merit, which presently brought him into the acquaintance of Chaplain, d’Herbelot, Thevenot, and several other persons of distinguished learning. This satisfaction was somewhat damped by the news of his father’s death in 1672 soon after which he left Paris to attend Mr. Paats, ambassador extraordinary from the States-general to the court of Spain. They set out in the spring of 1672; and our author went thence into Italy, where, visiting Tuscany, he was entertained with extraordinary politeness by the great duke, who, among other marks of esteem, gave him a very considerable stipend, and the professor’s place of Pisa, vacant by the death of Chimentel. This nomination was the more honourable, both as he had the famous Henry Norris, afterwards a cardinal, for his colleague; and as he obtained it by the recommendation of Magliabecchi, whom he frequently visited at Florence, where he had an opportunity of consulting the Mss. in the Medicean library. Having spent two years in Tuscany, he quitted his professorship; and visiting Venice and Padua, he passed through Germany to Leyden, whence he went to take possession of an estate left him by his mother’s brother, at Deventej. Here he sat down closely to his studies, and | was employed in preparing an edition of Livy in 1679, when he was nominated to a professor’s place at Ley den, which he accepted; and by his inaugural speech obtained an augmentation to the salary of 400 florins a year, which was continued to his death. He was particularly pleased with the honour shewn to his merit; and Leyden being the city preferred by him, as the place of his education and his father’s residence, he resolved never to leave it for the sake of any other preferment. 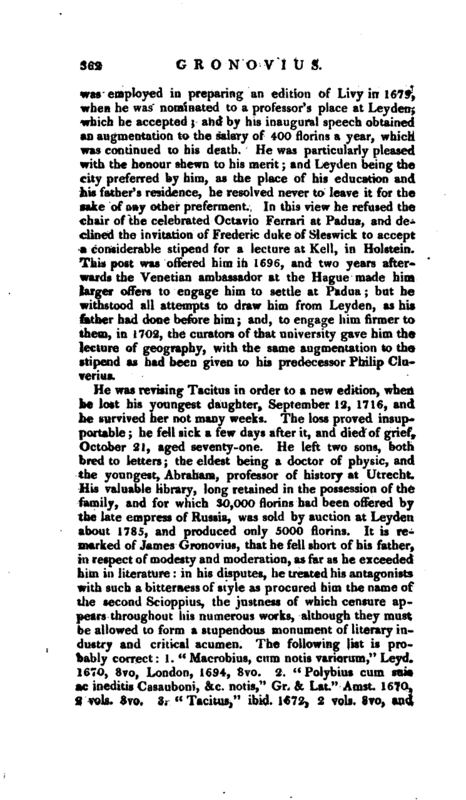 In this view he refused the chair of the celebrated Octavio Ferrari at Padua, and declined the invitation of Frederic duke of Sleswick to accept u considerable stipend for a lecture at Kell, in Holstein. 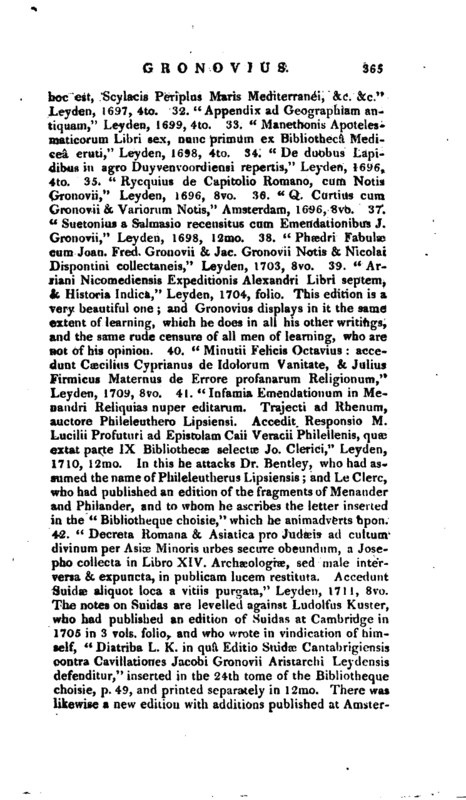 This post was offered him in 1696, and two years afterwards the Venetian ambassador at the Hague made him larger offers to engage him to settle at Padua; but he withstood all attempts to draw him from Leyden, as his father had done before him and, to engage him firmer to them, in 1702, the curators of that university gave him the lecture of geography, with the same augmentation to the stipend as had been given to his predecessor Philip Cluverius.